Any decision is only as good as the data it’s based upon. However, keeping databases current can be time-consuming and laborious. Ideally data would be instantly accessible and maintained by experts available over the web. Well, that solution is here. FIND Maps, an online mapping specialist, has just released a range of unique data feeds for desktop mapping software. Rather than having data gathering dust on DVDs or languishing somewhere on a network file system, this new service exploits the true potential of ‘data as a service’. FIND’s approach allows users to access maps and data on demand over the internet from cloud servers. This means that they no longer need to hold a full copy of the data they want to access, or to go through the process of ordering DVDs, awaiting delivery, downloading files and maintaining them in-house. With many years experience of providing data over the internet, FIND Maps has harnessed the benefits of recent technical advances to deliver this new data service. The result is instant access to professionally maintained remote data from a user’s desktop mapping application or GIS. FIND Maps specialises in the provision of geo-data for professionals. Until recently this was only available to purchase and download. Now, as a result of consultation with clients and collaboration with data partners, FIND has launched a range of online data services. Focussing initially on the marine engineering sector, FIND currently offers charts, vector themes, depth data and map tile sets. Other datasets from the FIND Maps archive will be available soon. These will include bedrock and flood risk, as well as core map sets from Ordnance Survey. Most GIS software can now access data over the internet - usually via WMS or WFS feeds. Importantly, this data can also be used directly within online mapping applications built on web mapping services such as Google Map. This opens up a radically different way to use and share ‘data as a service’ without the need for expensive CAD and GIS systems. At sketchmap.co.uk, FIND’s public mapping portal, users can add layers to basemaps, draw, annotate and then share links to maps they’ve created. 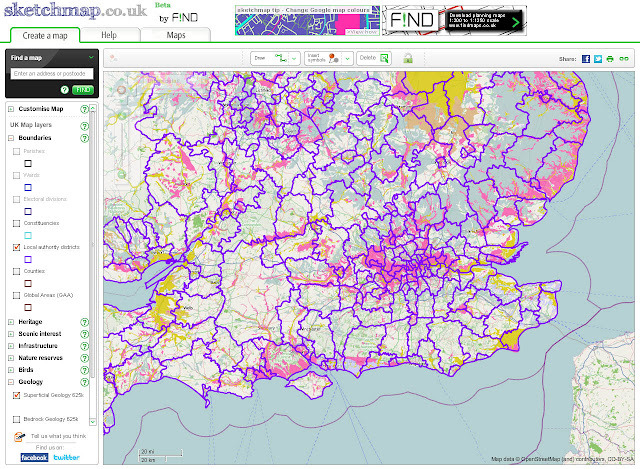 This free site gives just a glimpse of what can be achieved using online data. In our fast changing technological world software companies release new apps, versions and upgrades every week. More and more of these are being delivered via the cloud. Microsoft, the biggest of them all, recently introduced a cloud based version of its popular Office suite. Buying, or renting, applications in this way offers substantial costs savings as there’s no need for users to purchase, administer, maintain and host data themselves. It’s therefore easy to see why more and more users are demanding cloud based services. FIND offers free monthly seminars in central London for those who’d like to explore the possibilities offered by ‘data as a service’.